Earlier today, the Wake Forest community converged on the Upper Quad for the 15th year in a row for Hit the Bricks. Now a beloved campus tradition, this eight-hour relay race raises money for the Brian Piccolo Cancer Research Fund. Since 2003, participants have run a total of 279,917 laps and raised $404,843. Along with other student-led philanthropy events such as Wake N’ Shake, Hit the Bricks has raised more than three million dollars. Head senior director Nicolette DeLorenzo and junior director Paige Nordland have been working behind the scenes, with fellow senior director Stephen Sullivan, to make this campus tradition happen. How did you get involved with Hit the Bricks? 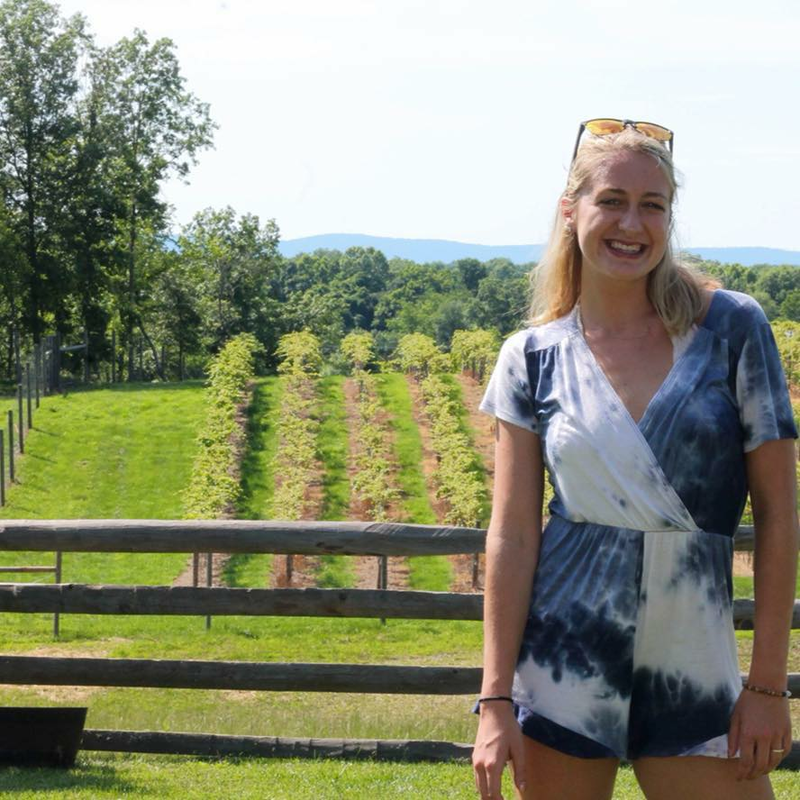 Nicolette DeLorenzo: My freshman year, I was on a team and in that moment, I decided I wanted, in some capacity, to have a leadership role because I just remember it being the best day of the year — I don’t even know why. I just thought it was so fun. I’m so competitive, so that’s what I liked the most. The next year I got the opportunity to be an entertainment co-chair, who sets up the schedule for the day. I decided I wanted to apply for more. We do a junior director, who transfers to be the head director their senior year, so I trained as the junior director last year. But it was basically that I had heard the hype and that it was a tradition and decided this is what I want to be involved in for philanthropy. Paige Nordland: I became involved with HTB my freshman year when my RA was really excited about the event and encouraged our hall to participate. Then my sophomore year, I applied to be a PR and marketing co-chair and absolutely loved the experience becoming more involved with Hit the Bricks. Now as the junior director, it is amazing to see how my involvement with Hit the Bricks has become so integral and positive to my Wake Forest experience. ND: We started planning for this year in February of last school year. The first thing we always have to do is send out co-chair applications because we have a leadership structure in which there are three student directors (two seniors and a junior) and 10 co-chair categories with multiple co-chairs. As a director, I run two co-chair teams: the raffle team and then the campus engagement team. I’ve had to schedule all of our meetings with the bookstore, who has a huge role in Hit the Bricks; reaching out to corporate sponsors; just logistically making sure everything is in place like contacting facilities; and nowadays promoting and fundraising and outreach to student groups. PN: As the junior director, I am directly in charge of my two committees, as well as communicating with all co-chairs on various announcements and meetings. This year, I have largely been responsible for communicating with campus partners and community food sponsors in Winston-Salem. I’ve learned through this process how to better communicate with these different partners and be held accountable to execute my tasks in a timely, clear and concise manner. What role do the university stores play? ND: Most people don’t know university stores have the manpower and the contacts. They help us set up with the facilities part, which is the stage, the stand for the backpacks and the tent. They donate their time. They’re the ones who do the scanning; their employees make that schedule. They also support us financially, providing the backpacks as well as other donations. We meet with them weekly starting a month out to plan for all of this. How do you see the efforts of Hit the Bricks and other philanthropy events play out on campus? ND: I think, and this is another reason I got involved, it is just how students can become really passionate about philanthropy and it’s something that everyone can be involved in. Hit the Bricks, Wake N’ Shake and other Brian Piccolo supporters and Project Pumpkin all have the opportunity to engage every single student group for a cause that is united. Us donating to the same research fund all year sets students’ minds to something that Wake Forest is involved in so it’s something I want to be involved in. It’s that uniting of the student groups and the philanthropy efforts. PN: I see the efforts of Hit the Bricks play out on campus as it is a very competitive, fun event, but one that also holds a large personal meaning and story for each participant. One of my favorite and beloved professors, David Coates, passed away this summer from brain cancer. Hit the Bricks is to me, as it is for many others, one way we can honor those loved individuals. Do you have a favorite memory from Hit the Bricks? ND: Last year, when I was the junior director, I was also on the team for my sorority. We always do a big incentive at 3 p.m. and the past couple of years it’s been the track team incentive, so the track team will run for your team for 30 minutes, which obviously helps you get a lot of laps. I remember it was 2:30 p.m. and I had told my team that we were down by $2,000 and was like, “Oh, well.” But then my team ended up raising $2,500 in the next 30 minutes to get this incentive, which was just the beautiful combination of our competitive spirit and then all of these people were calling their parents, calling their friends — it was amazing. PN: I don’t have a very specific story, but I have fun memories from getting ready on the day of the event last year when we showed up to see that we all had camouflage-printed Hit the Bricks team shirts. But really, the best memories for me come from an overall range of emotions on the day of the event: the rush of excitement, silliness, heat exhaustion, happiness, sadness, community and appreciation for the ones we love. What does Hit the Bricks mean to you? ND: I think it’s a reminder of perspective. For students, a lot of them dedicate their whole days to being out on the Quad to donate both our time and our resources to something we all care about. We’ve all been affected by cancer in some capacity. We support this research fund that does this incredible work at Baptist Health. Seeing how students can step away from Wake Forest, step away from schoolwork and donate those resources is so awesome to me. PN: Hit the Bricks is our campus coming together to honor people we love in a community who shares that network of love and support.